I could tell you how Studie caters to everything from street cars to race cars and brings in some of the biggest German brands out there, like AC Schnitzer, but since I was taking Project Drop Top to the Tokyo store to have my new wheels, tyres and suspension fitted, I thought it was the perfect opportunity to wander around and bring you a little tour of the place. The first thing that grabs you on arrival are all the cars parked outside. You might recognise this Alpina C2 2.7 from the full feature I posted earlier in the week. 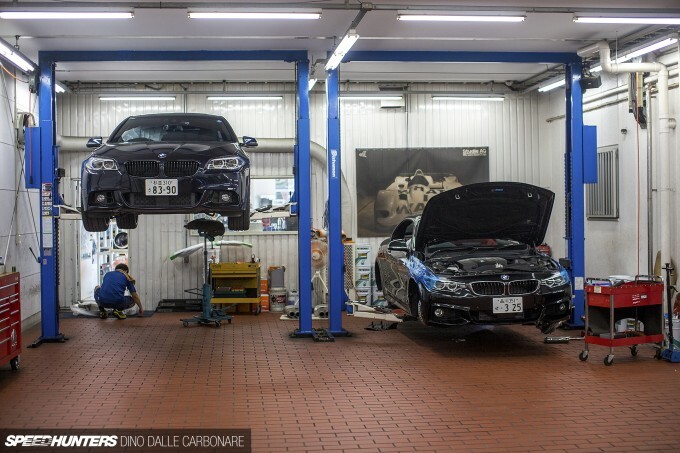 Since Japan is one of Alpina’s strongest markets, it’s not surprising to hear that quite a few of these special machines turn up for Studie to work on and maintain. Like this B10 wagon that was parked on the gravel space in front of the shop. 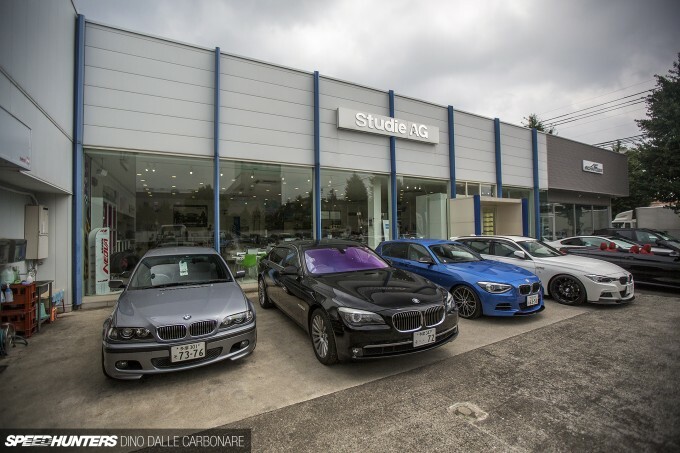 Most customers come to Studie looking to make their BMW a little sportier through performance and styling upgrades, and that goes all the way up to the top-of-the-line 7 Series. 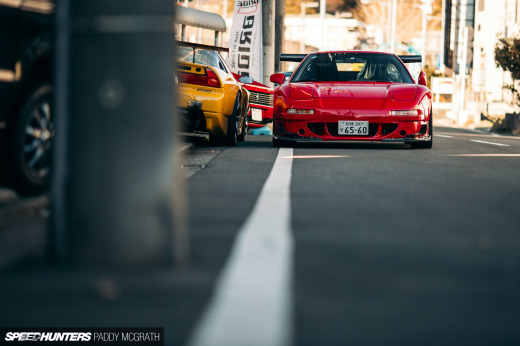 What makes Studie a little different to many other Japanese tuners is that it runs its own Super GT programme. The team’s itasha Z3 and Z4 that Taniguchi drove in the GT300 class are cars that everyone will remember, but I’ll leave those for a proper feature once the Z3 is moved out of the tight nook it’s currently positioned in. 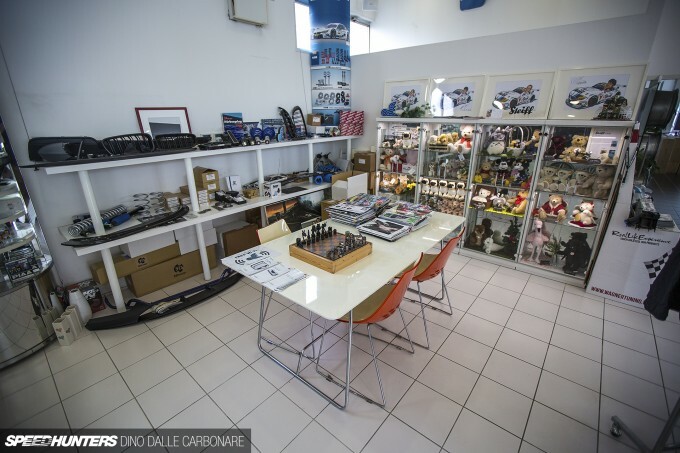 After I was done checking out the mix of customer cars and AC Schnitzer demo machines that were parked outside, I stepped into the shop itself. On opening the door it immediately feels like you aren’t even in Japan. 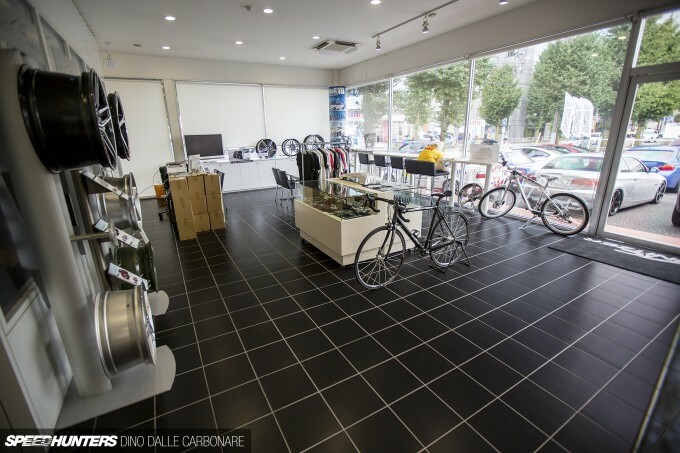 The showroom has a high ceiling and is brightly lit, and the stark white tiles that are used throughout have a very European feeling about them. 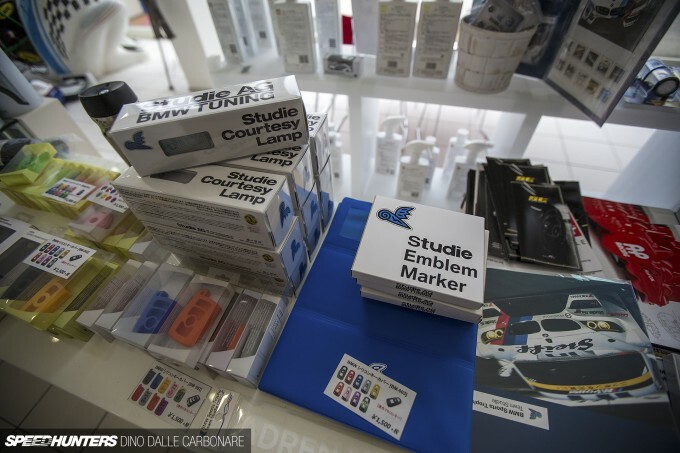 Studie must import their cleaning products too, because I swear even the air smells different in the showroom! 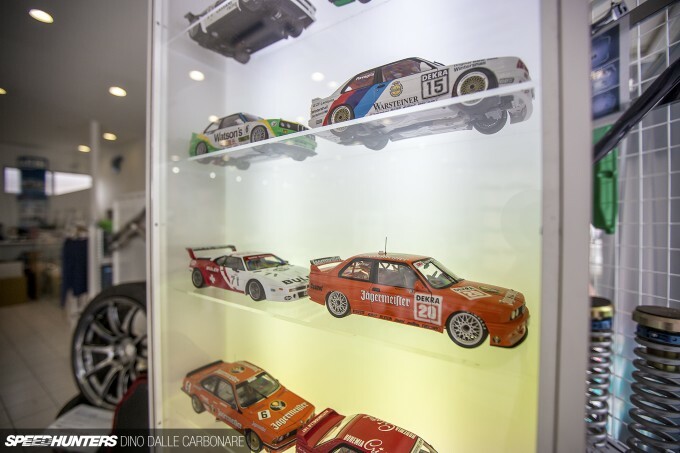 The first thing that grabs your attention are the backlit display cabinets filled with models of some of the most famous and recognisable BMW race cars. 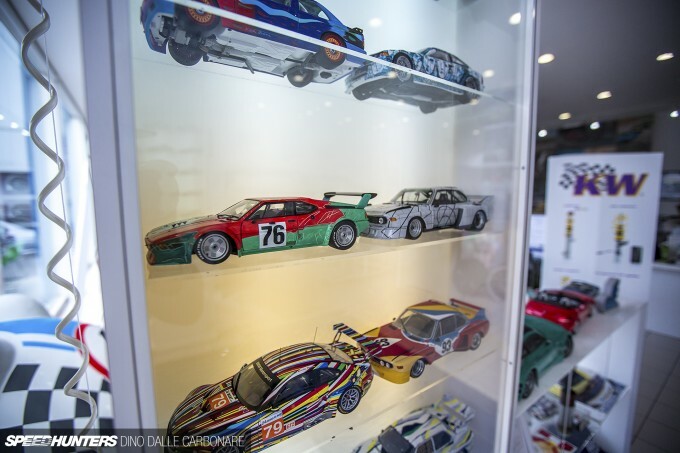 Check out the #76 M1 Art Car and the Frank Stella 3.0 CSL – so cool! 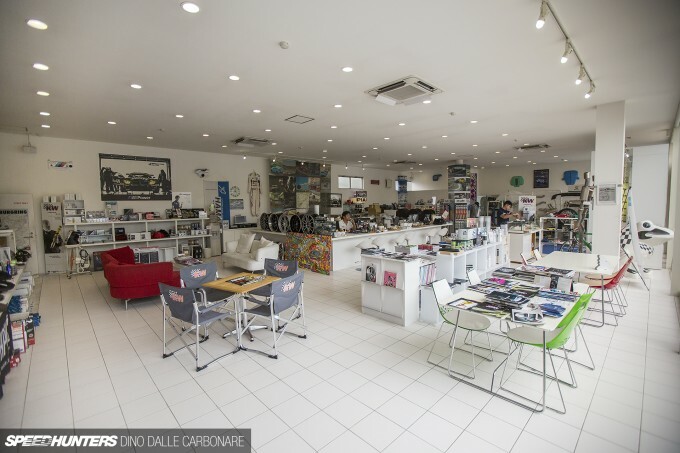 While Studie creates its own basic dress-up parts and accessories, it also supports a number of aftermarket manufacturers from around Japan and further abroad. 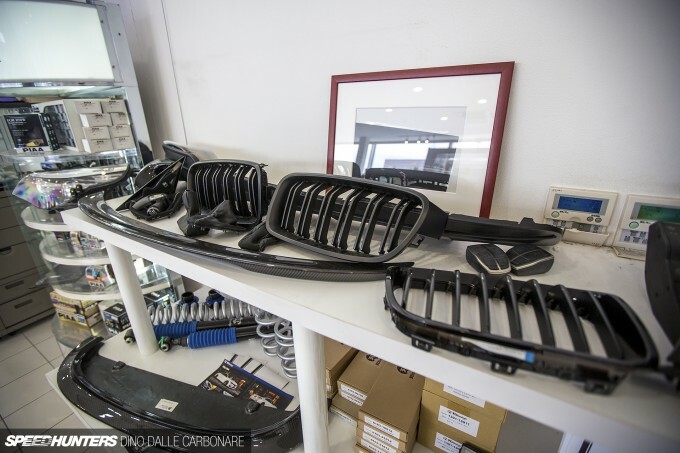 At the front of the shop is a display featuring performance components from 3D Design, a Japanese company that designs and manufactures aero parts and exhaust systems for BMW’s current model line-up. 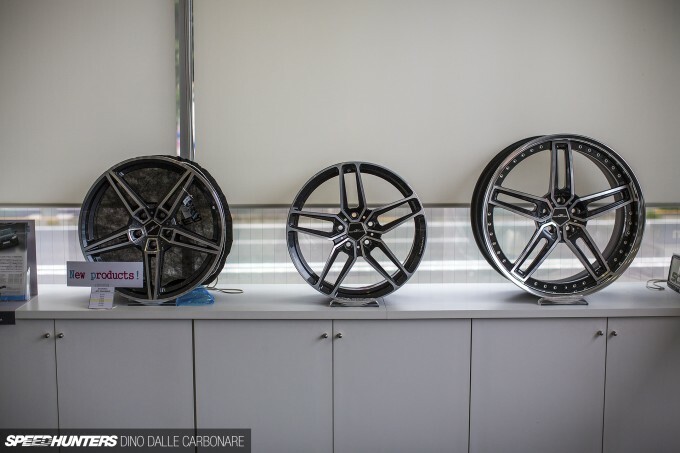 Wheels are a popular upgrade and Studie keeps a wide range of options on hand. 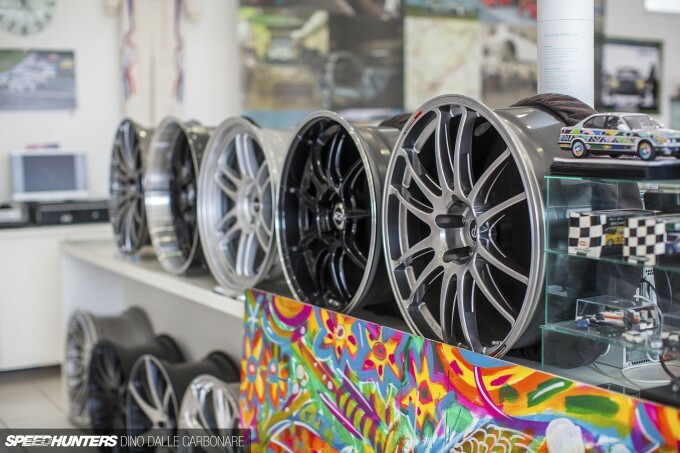 It also has a special gallery section on its website showing customer cars fitted with different wheels it sells, which offers plenty of inspiration if you’re a BMW owner trying to decide which way to go. 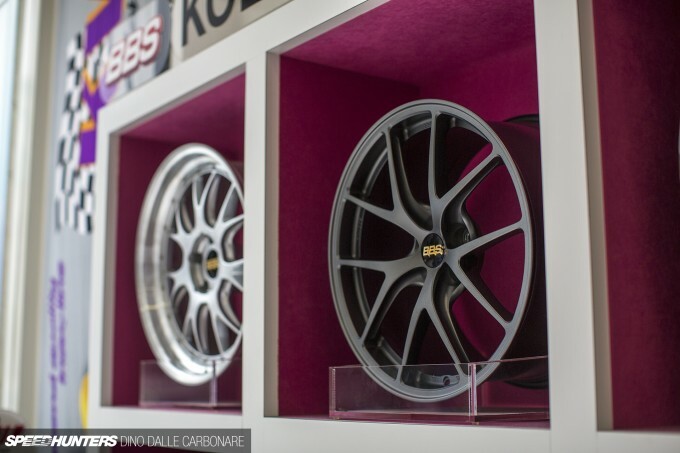 BBS has always been the most popular wheel choice for Studie customers, which is not surprising given the wheel maker’s affiliation to Studie’s GT racing endeavours. There is seating for about 25 people in the shop alone, which comes in handy when the workshop is busy. If Studie’s customers are anything like me however, they’ll spend most of their time wandering around looking at all the upgrade parts on display. 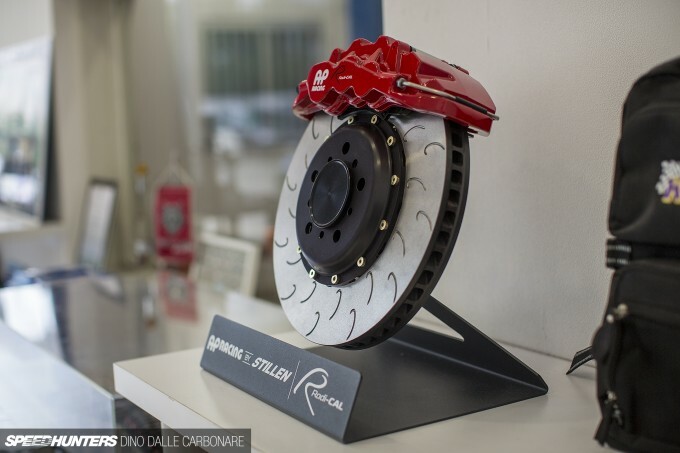 Brakes are something you see a lot of BMW owners in Japan going for, as it’s one performance aspect that the Bavarian automaker often falls short on. 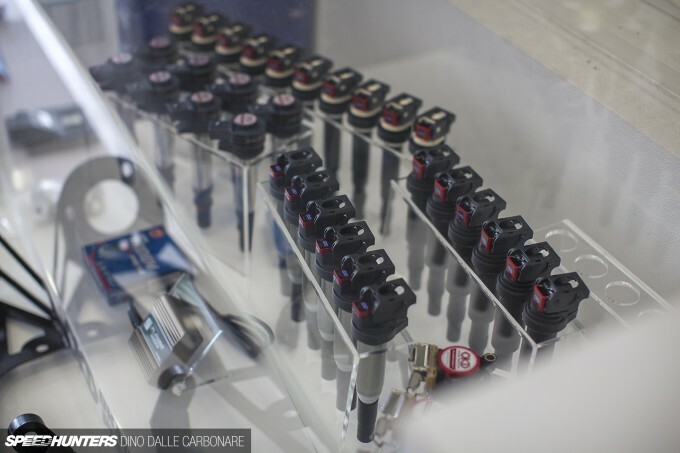 If you start running a little more boost or you just want to increase the efficiency of combustion in your engine, then an ignition upgrade is always a good idea. These Okada coil kits are becoming popular in the import scene too. 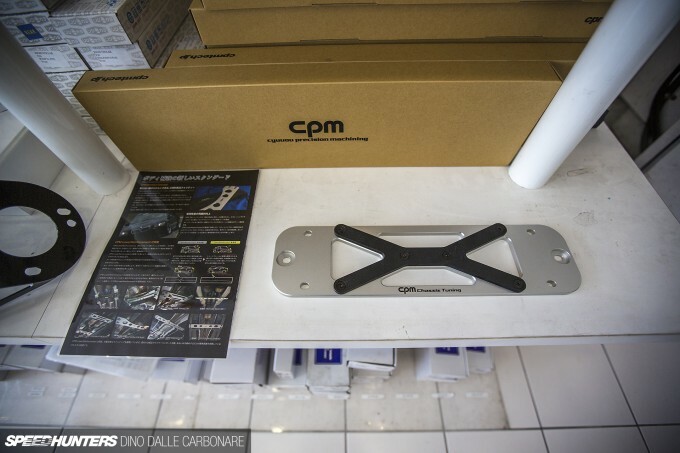 CPM Tech is another Japanese company – one that specializes in improving chassis stiffness. This particular plate mounts on the underside of the car to reduce flex along the transmission tunnel. 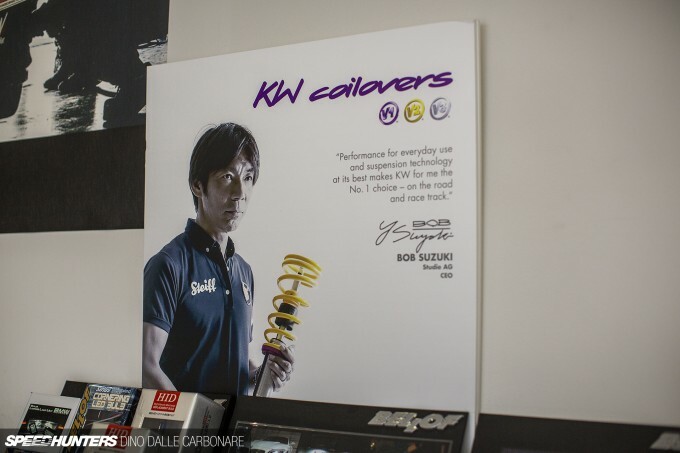 Studie’s founder Bob Suzuki has had plenty of success with KW suspension in race and street applications, so I wasn’t surprised to see that he’s been featured in the company’s marketing material. 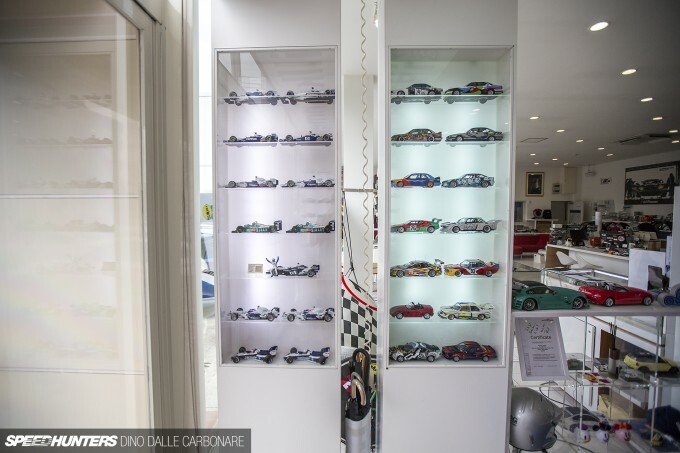 And talking about success, there’s a shelf in the showroom dedicated to all the trophies and awards that Team Studie has earned over their years in Super GT. 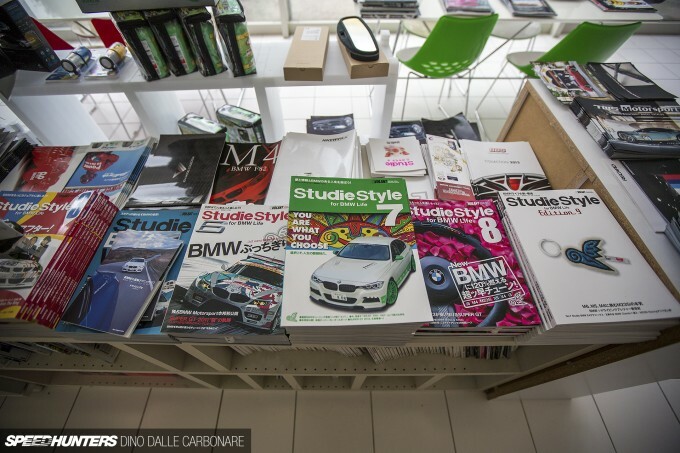 Studie even publishes its own magazine, which is a nicely put together publication that not only showcases the company’s own cars and products, but also explores BMW lifestyle, motor racing and more. If you follow GT300 you’ll definitely know the name Seiji Ara. The Team Studie driver dropped by while I was at the shop, so I had the chance to say hi and check out his extensively-tuned 320D wagon. You might remember Ara-san from the Motorhead Hill Climb held at the Hakone Turnpike last year. 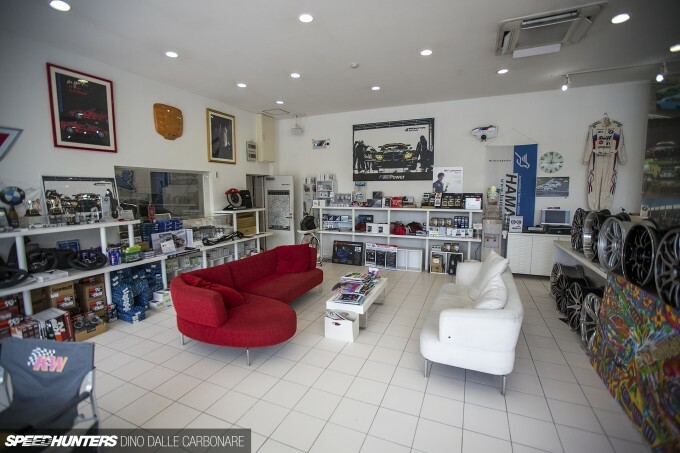 Next door is the AC Schnitzer showroom, which you can access directly through the Studie shop. 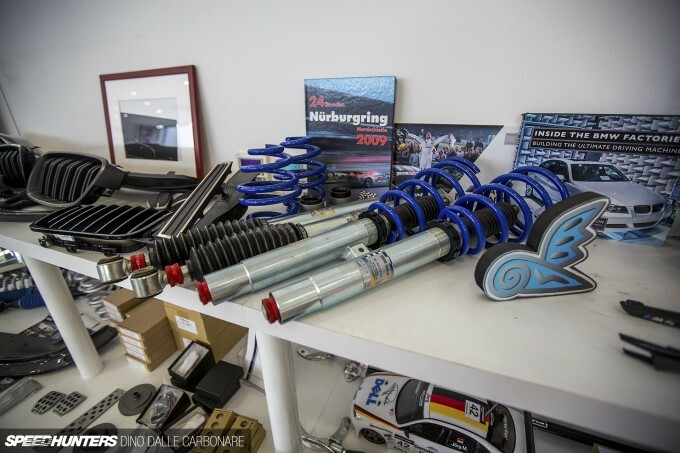 This is the place that BMW owners who want to give their cars a proper German tuning feel come to select upgrade parts from what is an extensive catalog. 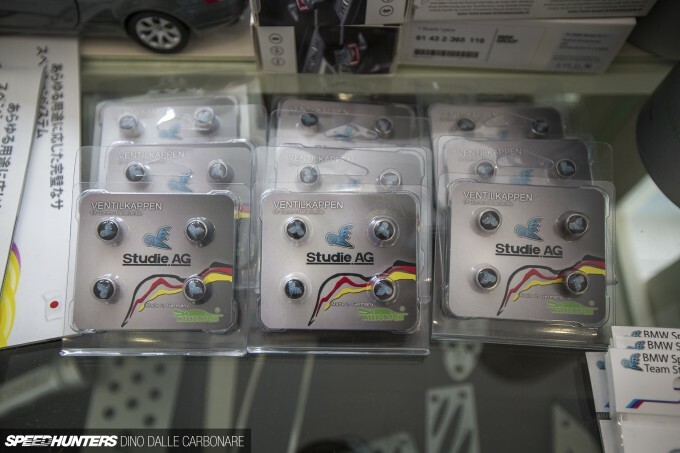 Included are AC Schnitzer power packages to get the most out of BMW’s new turbocharged engines. For how cool the shop was, the garage part of the building is where I spent most of the time while Project Drop Top was being worked on. 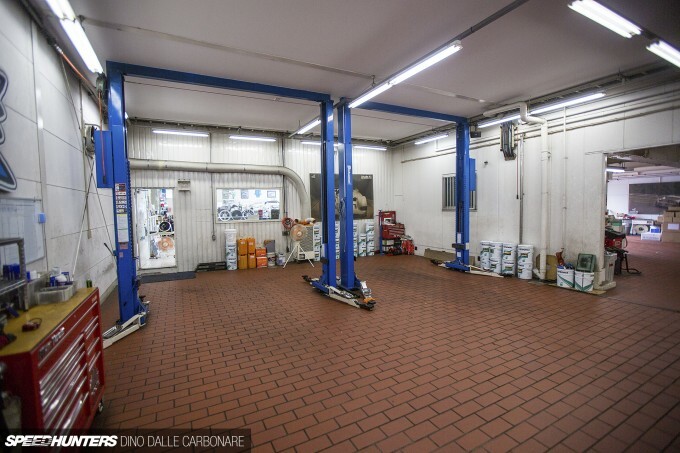 The workshop has four lifts with one doubling as an alignment rig. This area has a real European feel to it too, mostly due to the terracotta tiles that were specially imported from Germany for every Studie outlet. Talk about wanting to keep things authentic! 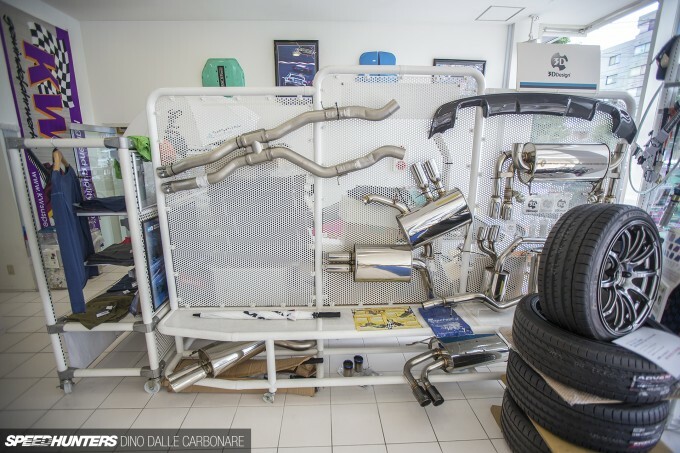 The other side of the workshop serves two purposes – firstly as a storage area for parts, and secondly as a place for the mechanics to prepare parts like suspension and exhausts on the workbench ahead of them being fitted and set up. 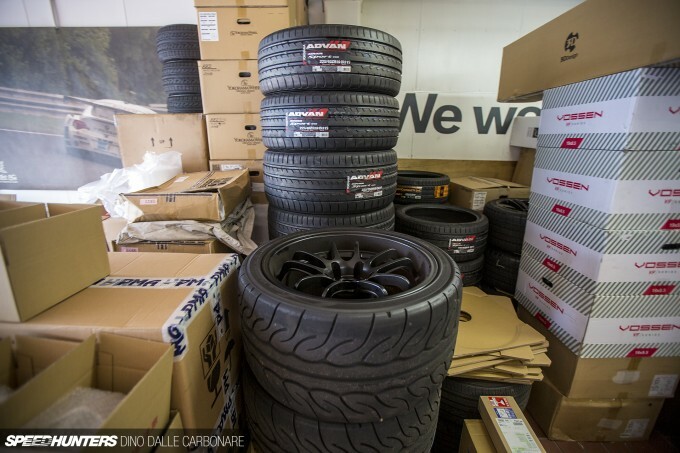 There were a lot of new wheels and tyres waiting to be fitted to cars that were coming in on the weekend. 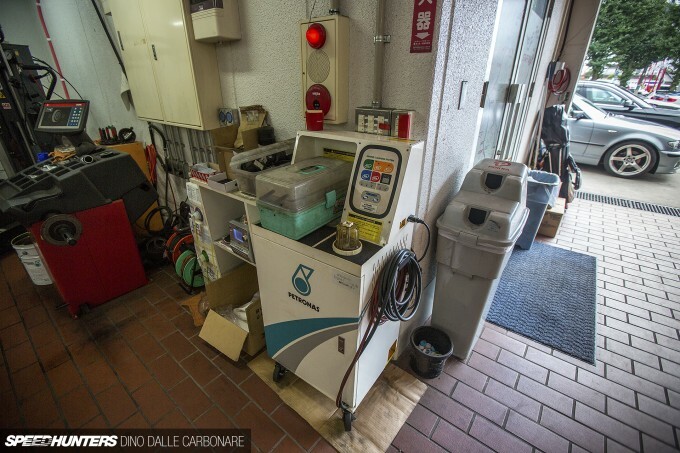 The tyre fitting and balancing corner at Studie gets a lot of use as Japanese BMW owners really love to change the wheels on their cars. 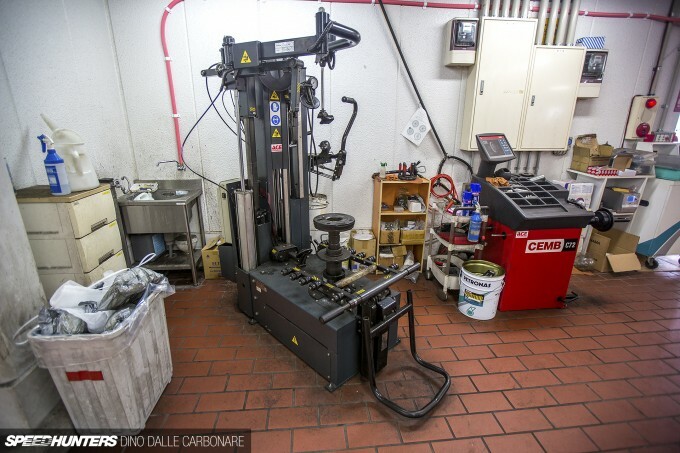 The Italian Fasep tyre changer is beautifully automated and a pleasure to watch in action. 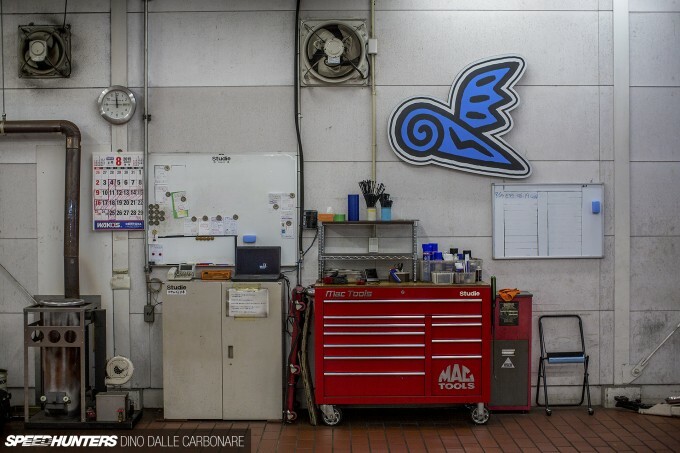 The anime livery on Studie’s race cars may have been dropped a few seasons back, but there are still reminders around the workshop, like these series of stickers I spotted on a tool trolley. 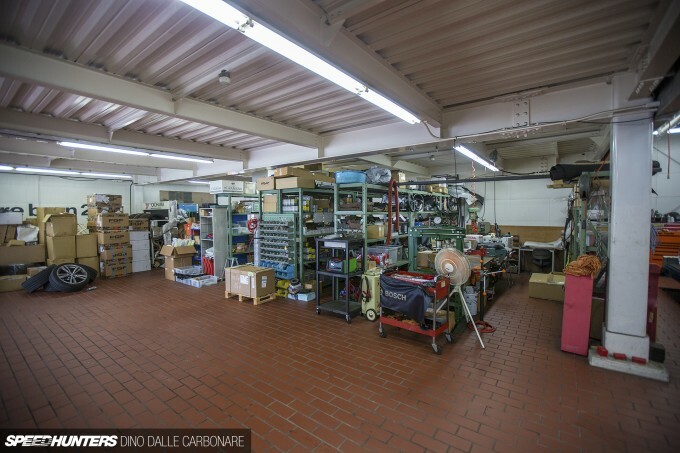 Like Studie’s race team, the shop works like a well-oiled machine. Everything is in order and proper procedure is always followed. 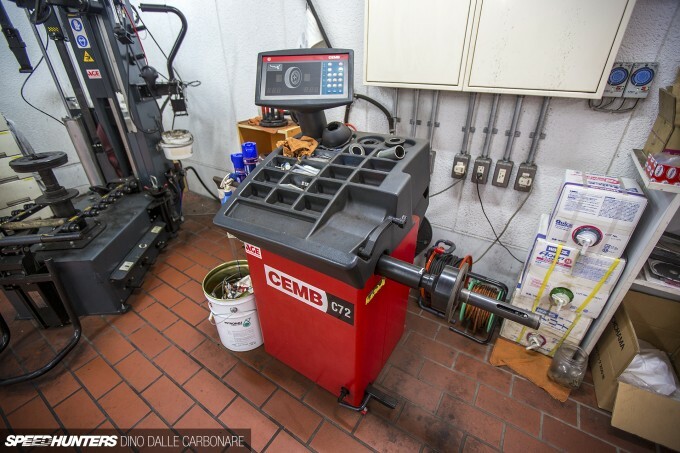 While I was there the CPM Tech M4 demo car came in to get some work done. As I mentioned earlier on, these guys make chassis stiffening plates for a selection of BMWs and had just pulled a new steering boss prototype off of their CNC machine. The Studie mechanics fitted it up so it could be tested on the road with a lightweight racing steering wheel added. 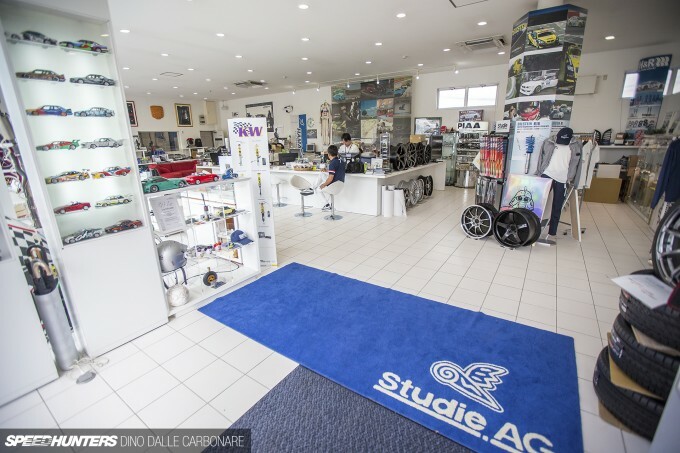 It’s just another example of the variety of cars and jobs that the guys at Studie AG are involved with on a daily basis. 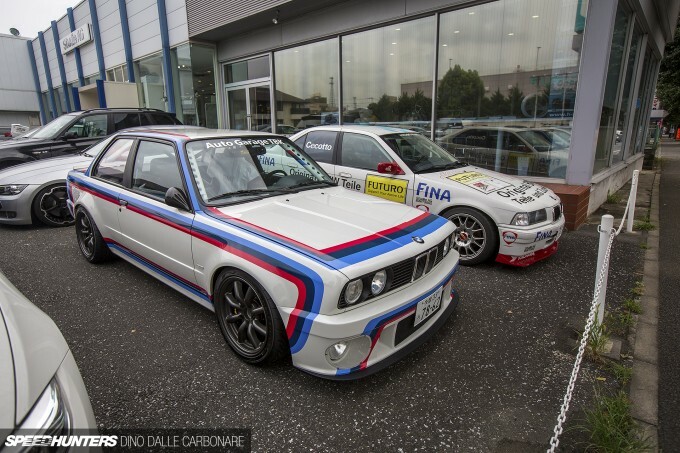 No pics of that itasha styled BMW racer? Kinda disappointed. 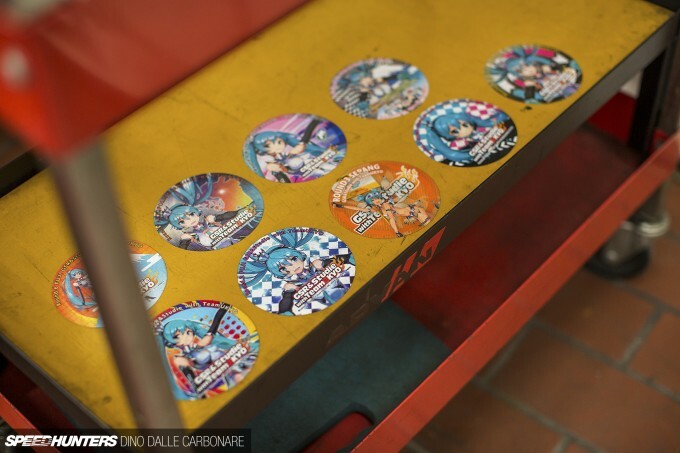 960 same with me, when Dino shoot car at parking lot, i can see Hatsune Miku Z4. Still don't get why you got a drop top instead of a coupe! The coupe looks a million time's better! 960 The team’s itasha Z3 and Z4 that Taniguchi drove in the GT300 class are cars that everyone will remember, but I’ll leave those for a proper feature once the Z3 is moved out of the tight nook it’s currently positioned in. 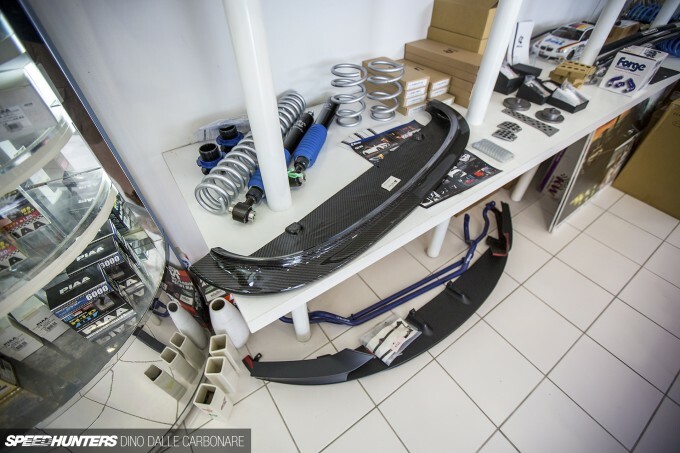 well,I curious are they have the last year GSR Z4? since now they're move to SLS. STJ88 Its kinda called Project Drop Top... Be kinda dumb if he got a coupe. 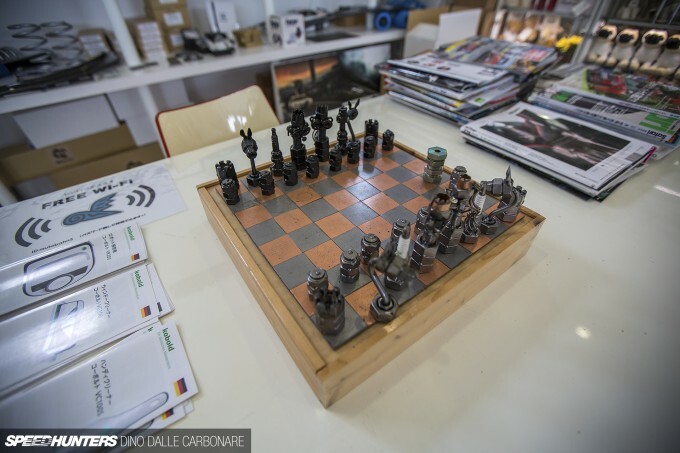 That chess set is super cool. 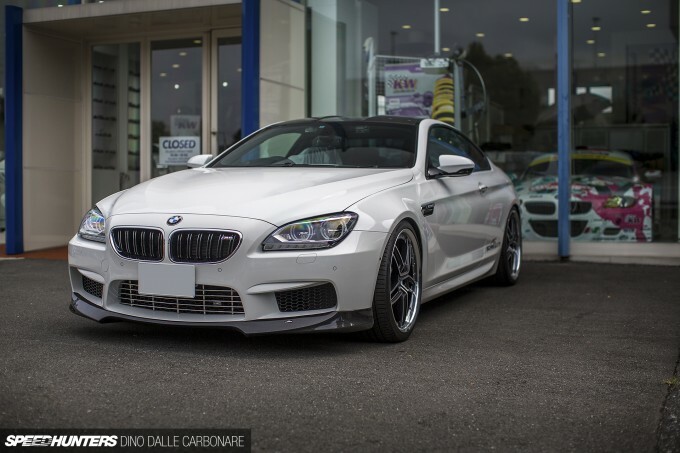 What rims are those on the M4? They look like AG or 1552. DavidTosh This is one I've been meaning to do for such a long time! 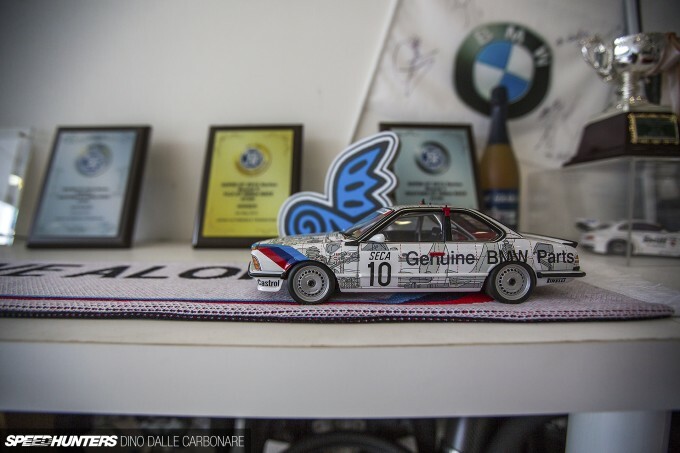 Excellent speedhunters_dino.! 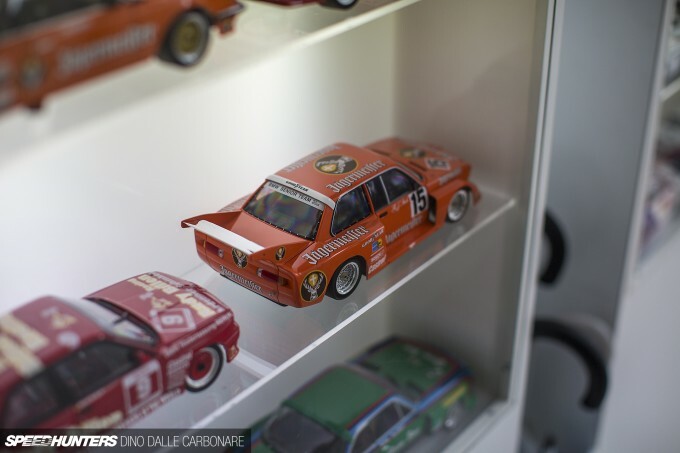 The model's display cabinets are a big temptation though! Haha oke fair and simple, personaly i can't stand the look of convertibles so thats why the question. On the other hand, i do love targa's like the new 911 and Supra and NSX used to be. Get to keep the cool looks of a coupe. STJ88 I actually prefer the convertible roof line for some odd reason. If it's a coupe, it would have to be an M4 and an M4 only as it looks much better with the pumped fenders. 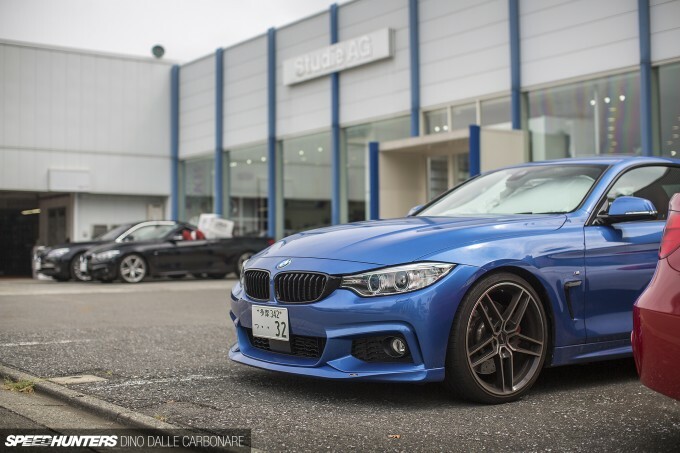 Too bad BMW Japan decided not to import the M4 convertible to Japan. 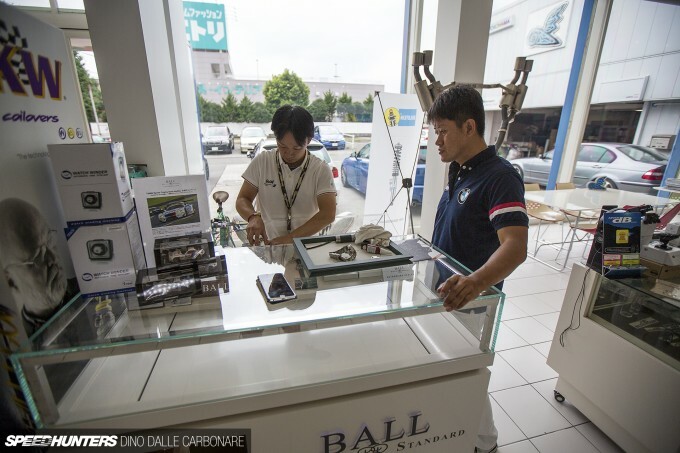 Can't blaim them convertibles sell horribly in Japan, unless their specialty cars like the MX5 and S2000. For that reason Nissan stopped selling the Z convertible in Japan and never even sold the G/Skyline convertible at all. speedhunters_dino 960 Looks like I was disappointed for no reason! 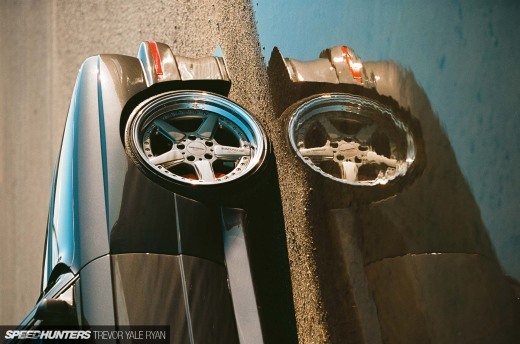 Gotta love Speedhunters! Every time I see their winged logo (don't know what it exactly is) I think of the Detroit Red Wings. 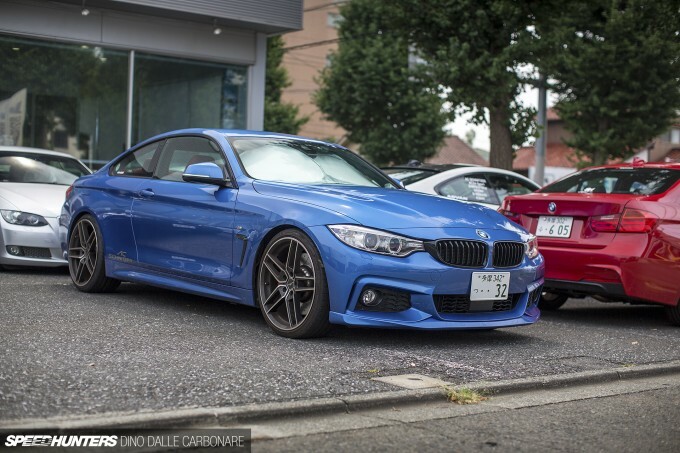 speedhunters_dino Dhikaz 960 No not that Studie Z4 GT3 but I mean GSR Miku Z4 GT3 2014. Wow, that facility is staggering! German engineering and Japanese attention to detail; unbeatable combination! Great shop love these articles! There seems to be a bug in the article in presentation mode (at least for me in Firefox and Chrome) in image 11/50 the whole article appears in the box if you scroll down, after 11/50 text appears twice in every box. DAMMM ! I pass through this place every week and never stopped to check! They should do BMW motorcycles as well. 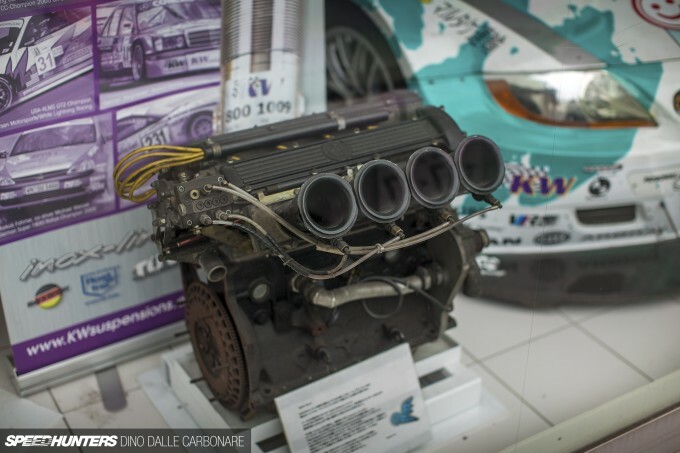 Just imagine a Hyabusa engine swapped in a coupe Bimmer 2002. Now that's is where they're next project should be. After all what's the founder's last name ? speedhunters_dino 960 Looking forward to it Dino! STJ88 but at least give people the choice.